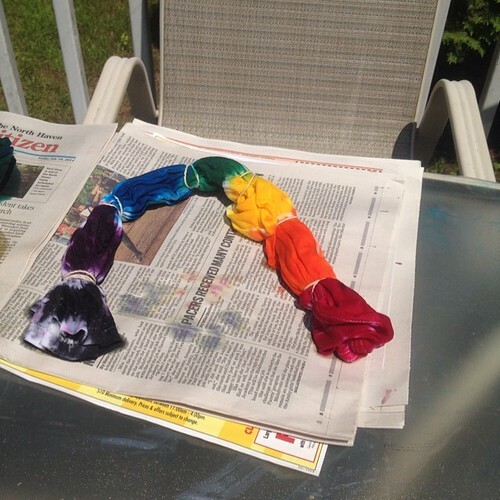 July 23, 2014 ~ Dye! Dye! Dye! | Whatever! July 23, 2014 ~ Dye! Dye! Dye! Today we had a tie-dye play-date! It was fun. Well, once we got stuff set up and prepped and then stopped the girls from jumping on furniture and throwing dress-up jewelry. To be fair, they were excited for both the play date and to tie-dye. They haven’t seen their friends from day care in a few weeks. I thought it would be easier to have one girl go at a time, so took Ashlin first, leaving Teagan to play with her friend. 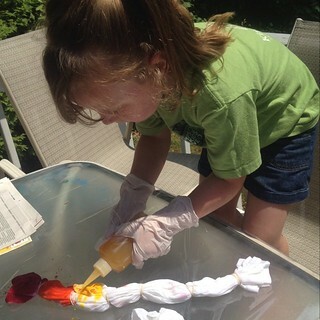 Ash didn’t like the gloves, but did ok putting the dye on her shirt. Teagan was very eager, starting to squeeze the bottles before turning them over and aiming on the shirt. It was chaotic fun. With popcorn. I even got a chance to try to make a sunflower shirt. I can’t wait till tomorrow to see how they turned out! I rinsed them out last night. I think they turned out great! Pictures will follow shortly. It was so much fun, we will totally do this again! Thank you :) I am trying to make this a fun summer. For everyone! Pictures of the finished shirts will be up soon! !